It's been over 3 weeks since my birthday, but I've finally had time to celebrate it last week on Sunday! If you don't know, I recently turned 18 years old!!! I had to put my birthday celebration off though because I was going to be heading to NY only a few days after my birthday. (I recommend you read my NY vacation recaps here (part 1) and here (part 2) if you haven't already because the picture are pretty awesome!) When I got back, I was super exhausted both physically and mentally so we pushed the dinner off until the week after! Usually for birthday celebrations, my family tends to go out for a simple dinner rather than doing something big. The person whose birthday it is gets to choose the restaurant so seeing how it was my birthday, I chose to go to Olive Garden for my dinner! We got ready to for dinner earlier than usual since we wanted to get home before dark.. plus since it was the Sunday before Saint Patrick's Day, we expected to have a long wait at the restaurant! Luckily for us, we actually didn't have to wait at all when we got to the restaurant because we got there so early! We were instantly seated and given our menus! 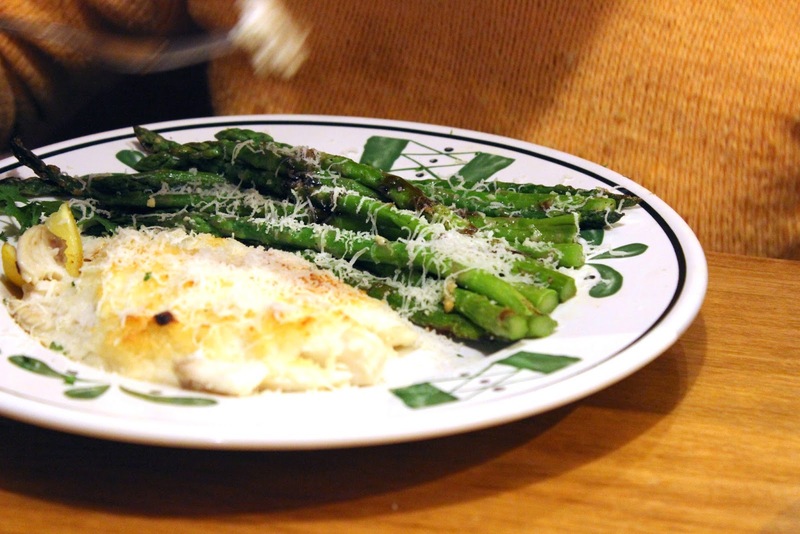 I actually went to Olive Garden a few months ago and I kinda already had an idea of what I wanted to get. I'm a vegetarian so most of the time at restaurants, my choices are a bit limited. I don't mind though since the choices I do have are usually delicious ones! As we pondered over what to order, our waiter came out with our unlimited breadsticks and salad! I love how olive garden gives us basically free breadsticks, soups, and salad. 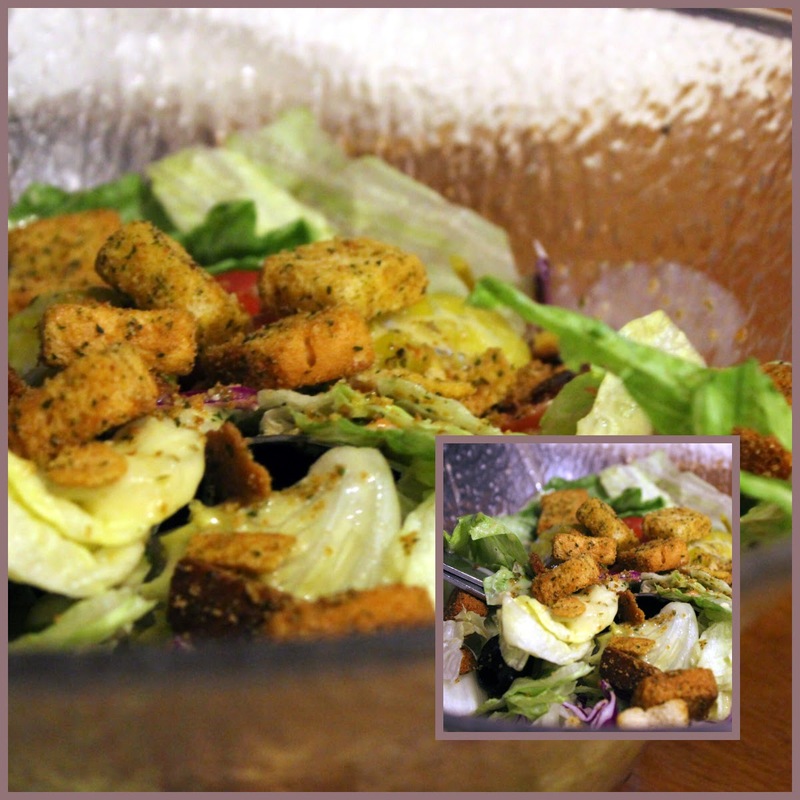 I am a huge fan of Olive Garden's breadsticks and the salad is pretty tasty as well. To be honest, I don't like pasta as much as breadsticks so I usually end up filling myself with the breadsticks that by the time the meal comes, I can't finish it haha... though they do give big portions there so I guess it all evens out! When our waiter came back around the 2nd time, we decided to order ourselves a mini appetizer. 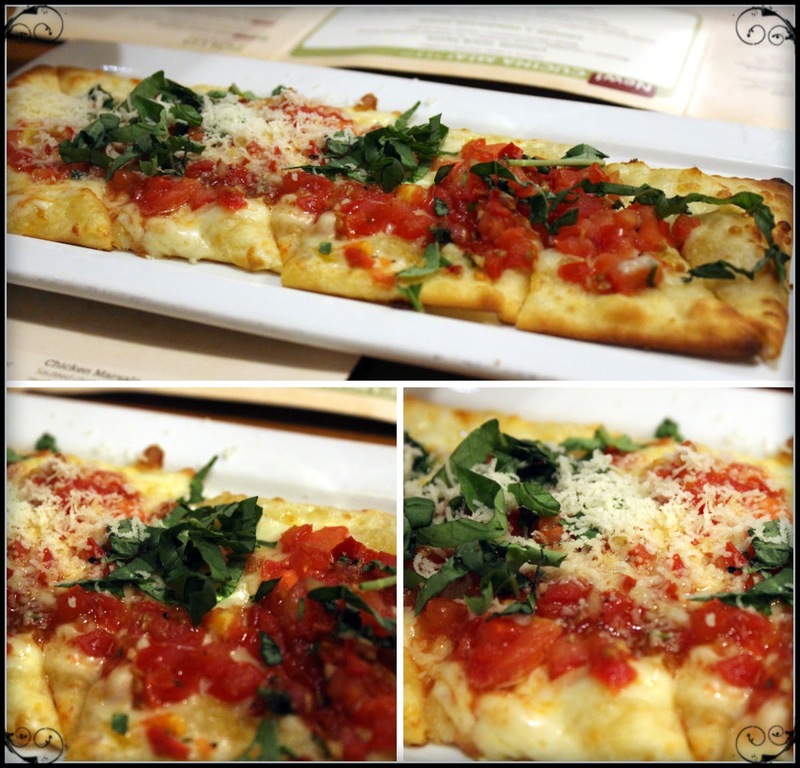 There were quite a few items on the menu that I thought I would love, but we eventually settled on something that all three of us would enjoy which was the Caprese Flatbread. This was quite the delicious item! It reminded me of a mini pizza, but with super fresh ingredients. The tomato was quite juicy and I loved the gooey cheese on top! As we ate our flatbread, we had to finalize our decisions on what to order. This next dish was what my sister ordered. It was the Chicken Parmigiana. From what I remember, this was a meal consisting of pasta and breaded chicken. 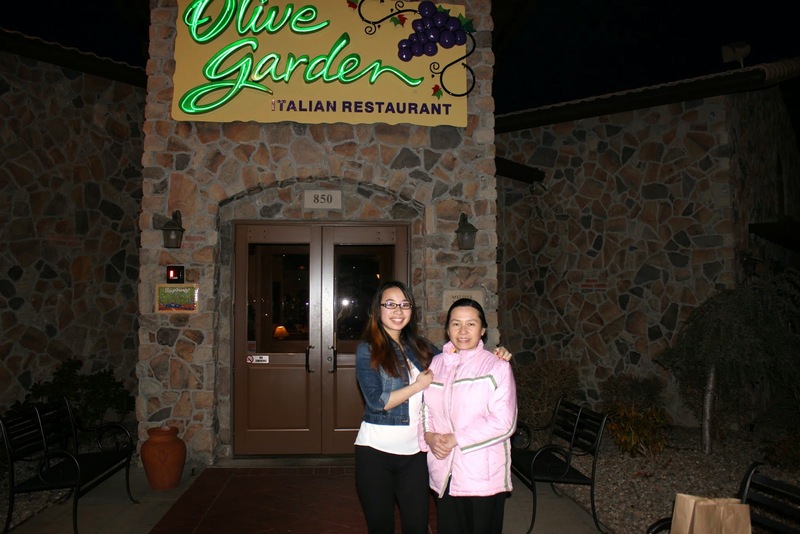 The first time I went to Olive garden for my friend's 18th birthday, I got something similar though instead of chicken, it was a fried eggplant. All I can say was the the fried eggplant was delicious! My sister also said that she really enjoyed this dish!! For my meal, I chose to order the five cheese ziti al forno. (That was quite the mouthful to try to say!) I had my eye on this dish for a while now because as you may know, I love cheese!! This pasta came out on a huge plate and they gave me quite a bit of pasta in my opinion! I am sort of a picky eater so what I ended up doing with my pasta was that I picked off all the cheese and ate that all haha. The pasta was also delicious, but the cheese was even better! 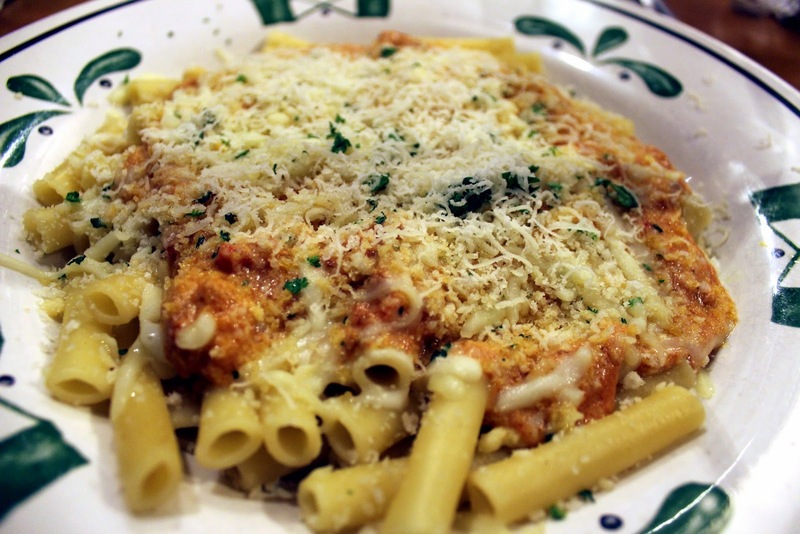 Overall I really enjoyed the five cheese ziti al forno and for the price, you really do get a lot of pasta! After we all stuffed ourselves full of pasta, fish, soup, salad, and lots of breadsticks, we still had some food leftover!! 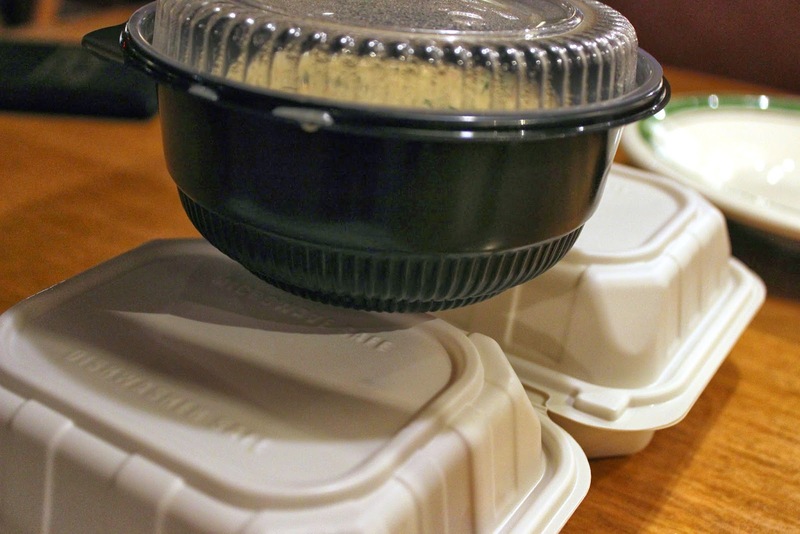 We decided to pack it up and bring it home for dinner the next day! The waiter for our table was also nice enough to give us some extra soup! Along with our leftovers, we were also given three mints. The mints that they give at olive garden are my favorite! 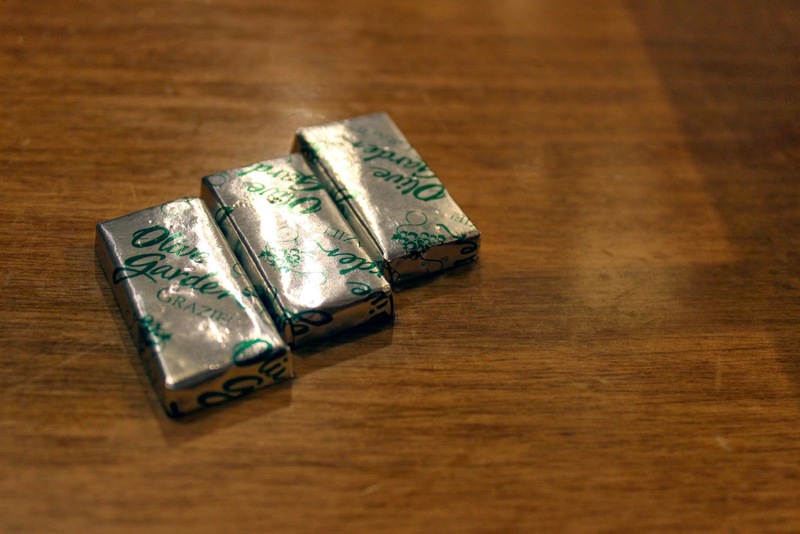 I know that they are most likely just regular mints, but maybe the olive garden stamp on it makes it taste just that much better! 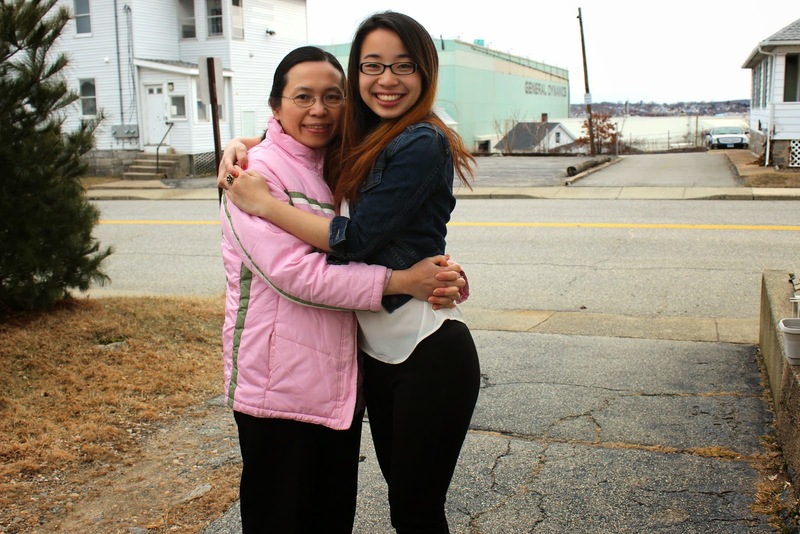 One last picture of my mom and I! hehe so much for getting home before the sun sets! It was such a nice dinner though and I had such a fun time out! March has been such a wild month for me. I have been so busy with school and scholarships, but at the same time, I have had such fun adventures outside of school! Senior year has definitely been one of the busiest for me as far as colleges + scholarships, but one of the funniest! I'm really going to miss it when it's over! How do you typically celebrate your birthdays? 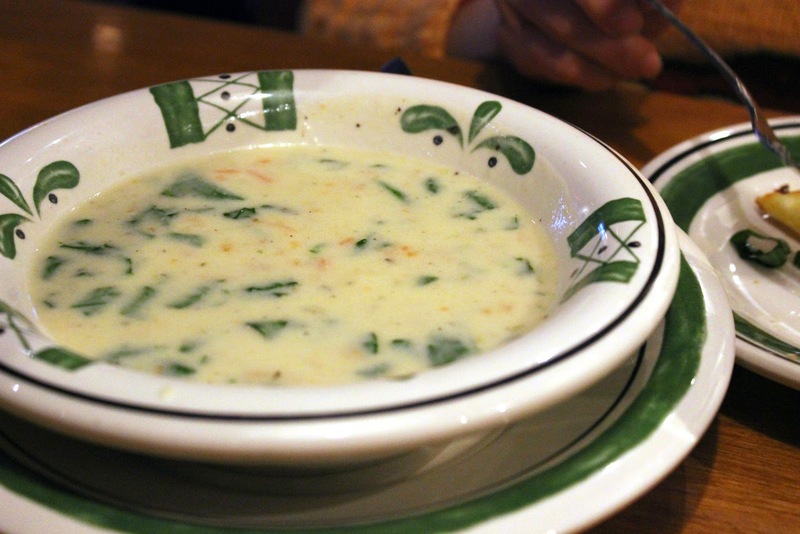 Have you ever been to Olive Garden? HAPPY BIRTHDAY MINDY!!! you had a delicious Birthday dinner I see your mom is so cute now you know why you are so cute. Glad to read you had a perfect Birthday. hehe yes it is a lot of delicious food!! I love the pic with your mother... so cute!!!!!! Thank you so much!! It was truly a fun time! Olive Garden is the one restaurant I've heard so much about but never ate at :o Everything looks so gooood *drools* I'm glad your birthday dinner was fun! Happy Belated Birthday!! That food looked good girl lol! Thanks and the food is delicious! hehe thank you! And yes being surrounded by food and family is the best way to celebrate! Happy Birthday. Even if it is a little late. Looks like you had a great celebration. Happy Belated BIrthday!! enjoy ur day! and such a sweet celebration! So glad you had a good birthday. 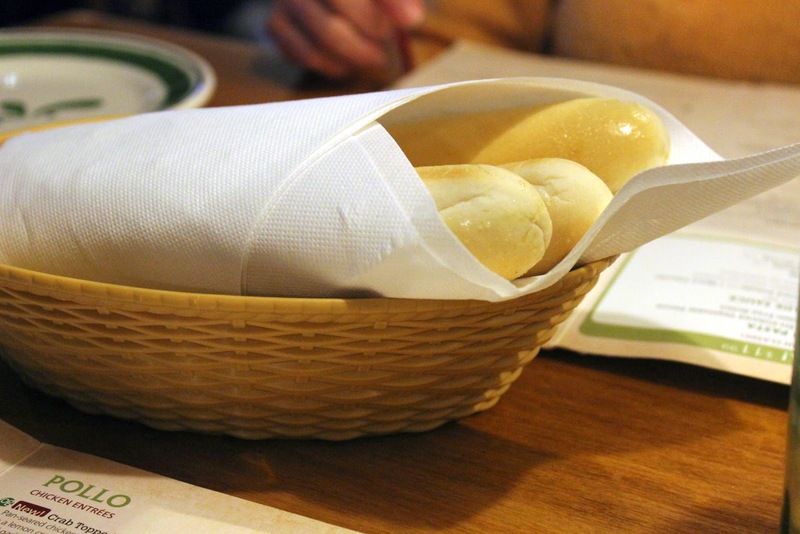 I haven't been to Olive Garden in a long time. I took my dad there one year for his birthday. I really like the all you can eat soup and salad. Thank you and that is so sweet! Yes the unlimited food is awesome! Happy birthday!!! thank you so much for your comment!!! Thank you!! I had a great time haha and yes the food is delicious! What a nice dinner! Happy Bday dear! Thanks and haha yes lots of food! Thank you so much and sure! I have never been to Olive Garden but I heard about it. I would really like to try it next time I go to the US and happen to be near one. The food looks outstanding! Yum yum! And enjoy this year - make the most of it. Yes! 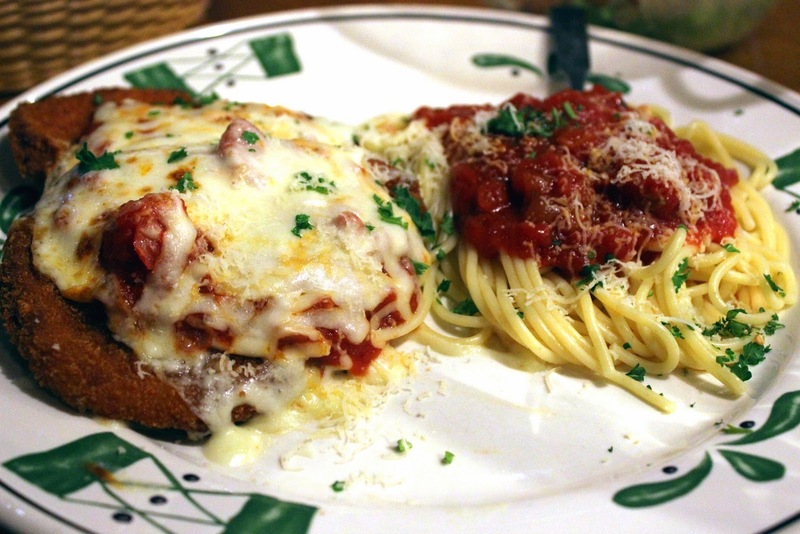 Olive garden is really good and I would def. recommend it when you come over here! I will do as much as I can before senior year ends! Thank you and ohh what a cool coincidence! hehe yes, the restaurant is pretty sweet! The food is so good and ohh.. I really need their salad dressings! It was so good!!! wow the food looks yummy! 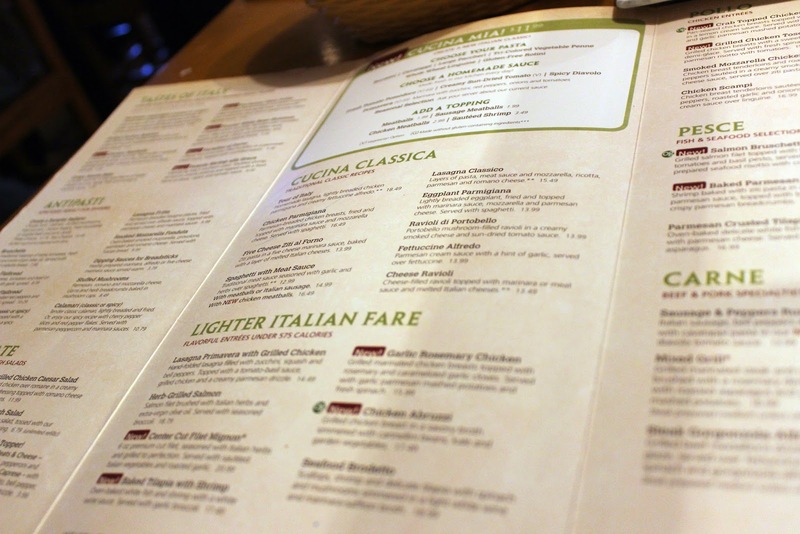 I love foods at Olive Garden, I used to live real closed to Olive Garden so I had lunch and dinner with them so often. they do have my favorite pasta there. Ohh, I rather go to bed, I'm starving:). Lovely pic of you and your Mom! Yes Olive garden is delicious!! I wish I lived closer haha! Happy birthday :D Amazing pics!! Hi Mindy, this looks a fantastic place for a birthday dinner, Italian is my favorite type of cuisine and I am mostly vegan just like you so I think Id have enjoyed it here too. Your pasta looks so delicious! Great food photography . Thanks so much for kindly stopping by...wishing you a marvelous weekend! Yes, Italian is really good! I am a huge fan of their breads and cheesy pastas haha! Thank you! !I love that photo a lot too! Happy birthday sweetie!♥ lovely pictures! :) and the soup looks so delicious! Thank you!! The soup was good!! Great birthday meal! Seriously, everything looks so good. The photos made me hungry, which is strange, considering I just had lunch lol. Thank you! Everything was delicious and haha, it happens to me too when I see pictures of food!! Happy birthday, dear! I wish you a lot of love! And these Italian food look so delicious! Thank you so much and yes the food was delicious! Thank you and everything was tasty!! Hehe thanks! She is very sweet! Home parties are usually far less expensive than hired venues and you are free to hold the party at whatever time suits your family and guests.